DALLAS---The 2017 NCAA Women's Final Four logo was unveiled during a celebration held at AT&T Plaza, prior to the Dallas Regional semifinal games being played at American Airlines Center. The unveiling was presented by representatives from the NCAA, Dallas Sports Commission and Big 12 Conference. In 2017, Dallas will host the Women's Final Four for the first time, with the national semifinal games set for Friday, March 31, and the national championship to be decided April 2. American Airlines Center, which has previously held NCAA Division I Women's Basketball Championships regional play in 2011 and 2016, will be the site for the crowning of the 36th NCAA national champion in women's basketball. "There is much anticipation from our teams, fans and stakeholders in having the Women's Final Four in Dallas in 2017," said Anucha Browne, NCAA vice president, women's basketball championships. "We look forward to working with the Big 12 Conference, Dallas Sports Commission, Dallas Local Organizing Committee and American Airlines Center in creating a memorable experience for all involved, as we know Dallas will be a great host for the Women's Final Four." 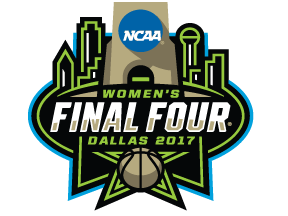 The logo for the 2017 Women's Final Four was inspired by the Dallas Convention and Visitors Bureau - "DALLAS, BIG THINGS HAPPEN HERE" - brand. Designed by Joe Bosack and Co., the green, blue, black and white Women's Final Four logo features the impressive Dallas skyline juxtaposed around the NCAA national championship trophy. Dallas' strong heritage of iconic athletes and teams, events and energy will be the backdrop when America's marquee women's sporting event comes to town next March. "This is an exciting weekend for the Big 12 Conference and city of Dallas as we host the 2016 Regional and unveil the logo for the 2017 Women's Final Four," said Dru Hancock, Big 12 senior associate commissioner. "We look forward to the next year of planning for this premier event that will culminate with the crowning of a national champion in our city. I know all of Dallas will join us as we embrace this opportunity and celebrate all of the young women participating in athletics." Fans who buy tickets to the Dallas Regional will gain early presale access to purchase 2017 NCAA Women's Final Four tickets in the fall. For those fans that can't wait until this fall, join the fun by becoming a "Finals Fanatic" in the 300 level of American Airlines Center for only $75 per person. Individuals in this location will receive an exclusive Finals Fanatics t-shirt with the 2017 Women's Final Four logo, food voucher, complimentary ticket to a Dallas Wings game, signed photo of a Dallas Wings player and airtime on the American Airlines Center videoboard during the Women's Final Four. Visit NCAA.com/WBBTickets to purchase your package today. "Dallas is very excited to begin the countdown to the 2017 Women's Final Four with today's logo unveiling," said Monica Paul, executive director of the Dallas Sports Commission. "We are grateful to partner with the NCAA and the Big 12 Conference to bring this celebration of women's basketball to Dallas and the American Airlines Center. We look forward to a spectacular event with great community initiatives that will have a lasting impact on our city."